Our big band correspondent reports that last night’s NYJO concert in Darlington attracted a full house. 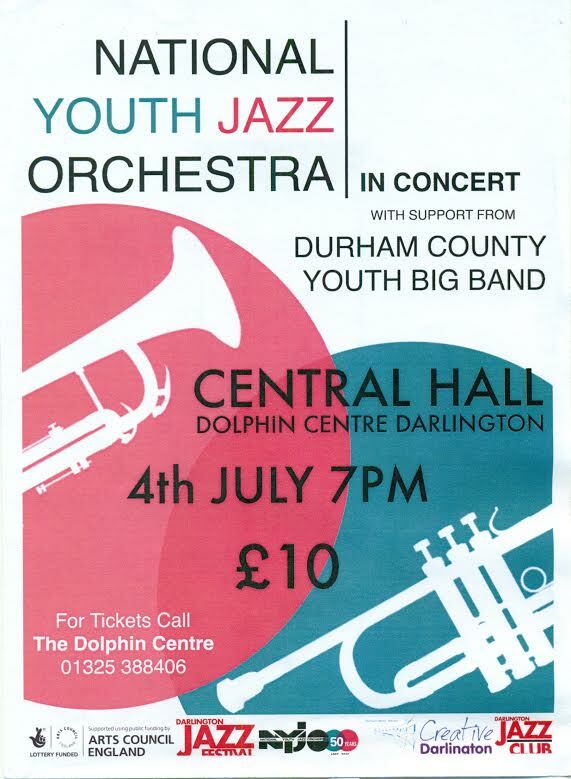 The Dolphin Centre’s Central Hall was at capacity for a big band double bill featuring the County Durham Youth Big Band and, topping the bill, NYJO. Bill Ashton’s world-renowned National Youth Jazz Orchestra, these days led by Mark Armstrong (born in Newcastle upon Tyne! ), rarely ventures north of Watford Gap. The occasional foray to Big Band Central (aka Wigan) or a foreign assignment (Milan next week! ), otherwise it’s mainly gigs within the M25’s orbit rather than Jupiter’s. Bebop Spoken Here’s Tony Eales noted a marvellous alto solo on Boplicity as a highlight of the Durham County Youth Big Band’s set. At short notice NYJO called upon Tom Hill to dep in the trumpet section and MD Mark Armstrong showed them how to do it with an outstanding trumpet solo of his own. Well done to Darlington Jazz Club for making this concert a reality. Few, if any, northern cities could be counted on to get the audience out on a Monday night for a big band gig. Russell - thanks very much for the kind review - but I must correct you about the location of NYJO's gigs, at least two-thirds of our 40 gigs a year are outside the M25. Ad they should be - the word National in our name is a clue ! Signed Nigel Tully, born in Barnsley - a proud Yorkshireman. Gentlemen, I take your point that NYJO gigs are more widespread. That said, I note that after Milan it's Kent, Cheltenham and several appearances in London!